I'm looking for a small refrigerator for a small cabin in the mountains. It's a weekend cabin so the fridge doesn't have to run for more than 4-7 days at a time. Is it truly worth going with a SunFrost refrigerator or are there similar ones for less money? Re: Is a Sunfrost Fridge worth it? Typically, the answer is not--they are not worth the money. We first published this editorial in early 2001, and have revised it several times. The last revision was August 2008. "Refrigeration is typically the largest consumer of electrical energy in an energy efficient home. However, the energy efficient SUN FROST refrigerator makes powering a home with photovoltaics, wind, or other low output energy sources both feasible and affordable. In a home using utility power, energy consumption for refrigeration is typically cut by a factor of 5 (80%). Along with energy efficiency, the Sun Frost offers other amenities not found in conventional refrigerators, such as food-saving, high humidity storage, quiet operation, and an easy-to-clean interior. The Sun Frost refrigerator typically reduces refrigerator energy consumption by a factor of five. 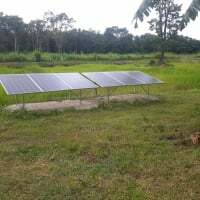 The accompanying cost of the solar power system is similarly reduced. The SUN FROST RF-16 12 volt DC model consumes 20 KWH per month, or an average of 53 amp hours per day. By contrast, conventional refrigerators typically consume about 110 KWH per month or 305 amp hours per day. Producing the 110 KWH needed to run this refrigerator on a solar power system would require an investment of around $12,000 in hardware, batteries, and inverter. A Sun Frost will reduce this cost by a factor of at least six because of its increased efficiency and the elimination of inverter losses. Inverters convert DC battery power to 120V AC." And it goes beyond what they put in print - at an RE show a few years ago, I heard a Sunfrost rep claim that the RF16 used only 8% as much power as a standard refrigerator. That is obviously ridiculous, but it was being sold as gospel. (in fact it is from 55% to 110% as much). Even now (April 2007), they still make claims like "Producing the 110 KWH ( per month) needed to run the typical refrigerator..." and "A Sun Frost RF16 will reduce this cost by a factor of at least six..". Both statements are plainly and obviously false, yet the same mantra keeps getting repeated. And if you do an internet search for "SunFrost", you will see the same statement time after time repeated on hundreds of websites (none of who have actually bothered to check the facts, apparently). A check in August of 2007 of the energy star website for refrigerators shows that many in the 18-21 CF range come in at under 400 KWH per year - which is a far cry from the 13,200 claimed by Sunfrost. And a typical one, like one Kenmore model rated 367 KWH per year costs over $2000 less than the Sunfrost RF19. I have a Sunfrost RF-19, and it has always had water condensing in the fridge section. It's especially bad in the Summer. I purchased it 5 years ago, and would never buy another one. Recently the latch broke and we held it shut with a bungie cord. I don't think this condensation is an inevitable trade off for efficiency. I attribute it to poor design, with the ineffective door seals. Do you ever have any problems with water collecting in the bottom of the fridge? Mine has done it from day one. I have an RF-16. I just didn't know if this is a trade off for the efficiency! They specifically state in their literature that they are quiet. From my conversation with them and your additional input I really don't expect any service from them. The two year warrantee is garbage. Their recommendation on the phone to stack acoustical ceiling tiles around the compressor was the first clue I was talking to a Bozo. I would recommend any body considering purchasing a DC fridge to seriously consider the new alternatives that are cropping up. The (Sunfrost) has been the only real game in town until the last couple of years and I think they have developed a "Were the only game in town" attitude. I wish I had known this before. I was seriously considering another manufacturer and bought Sunfrost because I thought I'd be getting the best and would have trouble free operation and great service. Fool me once.... Never again. I'm thoroughly DISAPPOINTED with our SunFrosts. I've replace the gaskets 2 (some 3) times. And still we don't get a good seal. One of the Freezers runs incessantly. There is always a build up of frost. (Indicative of air leakage). Half of the catches have broken. I've used the things less than 2 years. I quit replacing the gaskets with what SunFrost provides. They are just not temperature stable. SunFrost's gaskets shrink too much in cold, and then leak @ the corners. --- Obviously not everyone will agree with the comments above, but we felt they should be included. Two options--If the cabin is not used for the better part of 9+ months of the year, look at a propane powered refrigerator/freezer. You only pay for propane when you are there. Sometimes you can get a good deal on a used fridge from an RV wrecker. If you really want a solar powered refrigerator--take a look at a chest freezer conversion... Uses much less power (down to ~25% of a standard refrigerator) than any of the small refrigerators out there. It is a conversation we have had many times on this forum. In general, the more a fridge is used, the smarter it is to use the most efficient fridge. From a PV perspective, I am a fan of LP fridges for part time use, (weekends, holiday weeks etc) as they allow the Pv system to be much smaller. As for Sun Frost specifically I think you have to look carefully at real world performance numbers. Basic, simple Energystar fridges come at a much smaller cost, and perhaps nearly as good energy use numbers. Ps You got me by a minute! I knew that there was some controversy about SunFrost. you know i never bothered to check, but do you guys know if they make any of those small refrigs as energy star? You can use the Energy Star Search Tool. You will get 3 brands of E.S. listed refrigerators smaller than 8 cu.ft. Compare that with a 18.7 cu.ft. Kenmore that rated at 407 kWH per year--Ten times the volume using only 2x the amount of power. I'll have to get the kill-a-watt plugged into the fridge, and verify what I'm burning. Yea, I'd say go with LP. My camper has a frame mounted horizontal 5 gallon propane tank. The little Norcold 323 in my camper will run for 3 weeks on high, and 4 weeks on low from that tank. I usually leave it on low because on high it tends to freeze things. It's also dead simple - no thermostat or sensitive control board (the part that normally goes bad on an RV fridge). Thanks for the info. My client is h*ll bent on a SunFrost so I guess they will have to pay the price. What about these Sundazer units? Anyone tried one? Yes, they're pricey, but I was wondering if anyone had experience with them. I understand one could probably buy one of the freezer models and turn it to it's lowest setting then use it like a refrigerator without freezing the contents. I've heard roughly the same as sunfrost, a honest energy star fridge will work as well, repairable without "special parts", and gives more space. I own one and I'd say it's worth it. I measured 0.67 amps when the compressor's running--which isn't often. You could run for days off a 100 amp-hour battery. Incidentally, there's no difference between the freezer and the fridge other than the thermostat, which you can switch out yourself. The fridge thermostat will take you down to just above freezing. The freezer thermostat's warmest setting will still freeze. It would be nice if they offered a thermostat that spanned the freezing point so you could choose. But even without this, the unit is so simple and hackable that it wouldn't take much to add any thermostat you like. I own one and I'd say it's worth it. How long have you had it, and what size is it? Ordered the Sunfrost RF12A almost three weeks ago and have yet to see it. I guess they build them to order. It's pedestrian but block ice in the bottom of one of those super-insulated Coleman coolers does just dandy for 3-4 days. We have to fly into our cabin so saving weight and bulk is important. So, we pre-freeze the food and transport in soft coolers then right into the Coleman with the block of ice. Main challenge is getting my kids to close the lid tightly. The neighbor has a propane fridge-freezer and I confess to keeping a beer or two there (cold vs. cool) and borrowing a bit of mayo in an "emergency." Also, dug myself a very small root-cellar which keeps beer and soda nice and cool and it doesn't freeze in the winter either. Both of these options, while not refrigeration, are cheap (and my neighbor drinks hardly any of my beer). We have had our Sunfrost RF12 refrigerator for 20 years, using it as our only refrigerator serving a household of 3 in San Francisco. It has been reliable and has long since paid for itself in comparison to the refrigerator it replaced -- a 1950s GE that used 3.5kwh per day. We did experience some of the problems mentioned here and elsewhere (sweating, latch issues, seals failing, and the most annoying clogging of the drain), but have managed to fix or live with each issue as it arose. Our tolerance stems from the fact that we really really want to keep our energy consumption down and there is no competition. The only way to get a refrigerator with a freezer that is this efficient is to buy the SunFrost (at least according to the EnergyStar list). We would love it if Sunfrost could make improvements without losing the efficiency, and I suspect that they could (and would if there was some competition). Instead, they are probably totally focused on satisfying the demand for their worlds-most-efficient refrigerator. From an energy perspective, as long as the refrigerator works well enough that people are still willing to pay the price, maybe it is just best for them to be producing as many refrigerators as they can. We have had our Sunfrost RF12 refrigerator for 20 years... <snip>...Our tolerance stems from the fact that we really really want to keep our energy consumption down and there is no competition. The only way to get a refrigerator with a freezer that is this efficient is to buy the SunFrost (at least according to the EnergyStar list). That is not entirely true - in fact many of the Energy Star rated ones come very close to, and a few are better, than the Sunfrost (at least the 19) - and at 1/3 the cost and 90% less hassle. For us, purchasing a 12 cubic foot refrigerator was an important part of the energy saving decision. The old refrigerator from the 1950s that we replaced was also 12 cubic feet, so we weren't downsizing -- we just didn't upsize. And we have been perfectly satisfied with the size, even when we've had 18 people for Thanksgiving dinner. It's true that by purchasing one of those 400kWh commercial refrigerators (if they had been available in 1990) we could have saved $1000 dollars up front and would only have paid $700 more for electricity. There were definitely people who told us that would be a better way to go (financially more prudent). We were ready to take a loss just for the sake of seeing how far we could go with our energy conservation plans. Because of our conservation efforts, our electic use went down to a lower rate and then we were able to get solar panels and take advantage of time-of-use rates. When people ask why we would buy solar panels that might never pay for themselves, we ask "When will your car pay for itself?" We got rid of our car 20 years ago and that has more than paid for our solar panels (as well as the $300 we may have "lost" but will win back eventually by not buying that other refrigerator). Rather than having regrets, we are continually amazed at where this decision led us. A key here is to watch out for the time frame. There have been significant changes in refrigerator efficiencies in just the last few years. Comparing refrigerators now is not the same as comparison made even just a few years ago. Two years ago, we added a SunFrost freezer, also 10 cu. ft. It is every bit as good as the old fridge. The freezer makes a little more noise than the 'fridge, but neither is at all noisy, and we have a very quiet home [PV and wood heat, no motors or fans running all the time and two miles from the nearest highway or town or people]. We notice even a slight noise and I don't hear the SunFrost stuff unless I am near them, in the same room. Not an issue. The 'fridge is so quiet that I usually must press my ear up on the outside of the door to tell it is running. The only issue we've had is with the 'fridge, in which the freezer compartment must be defrosted once a month to remove ice build up. SunFrost sent me a new set of gaskets, which were quite simple to install but did only a little to solve the issue. I am accustomed to defrosting and just do it. With the freezer, I've defrosted once in two years. Customer service has been exemplary. I have had a few questions over the years and twice in 20+ yr. the door latch on the fridge has broken. They shipped me new latches pronto, for no charge, even 20 yr. out of warranty. I've always reached a human, immediately, when I called. These days, that is remarkable. As to whether they are worth the cost, for us they are. I paid a lot of money, to be sure, but then installed them and forgot about it. Except for the two door latches, no problems, no repairs, no down time. Ours are 12 v. models. As far as I know, they still make these to order and, yes, there is a bit of a wait to get them. I seem to recall our freezer two yr. back took 3 weeks to arrive. I have a sears 18cf frost free that uses a little over 1kwkh/day. It has been running for 6 years on my 1.2kw solar with two sets of 8 year old L16's in parallel with a 4024 trace inverter. Never a problem. My batteries have never dropped below 85%. Never owned a generator. Live in New Mexico, high altitude. The energy star ratings were a big help in choosing a fridge. Also have a sat tv, computer, etc. All heating propane or wood except coffee pot. I have had a Sun Frost R19 since 2001. It was the best in efficiency at the time in 2001. The Fridge is on top with the Freezer on the bottom. The freezer stopped working three years ago so I just was using my Crosley Shelvador chest freezer, but the Crosley is starting to take too much power and running most of the time so it is time for the Crosley to be gotten rid of after 15 years. The Sun Frost Fridge runs better than it did when the freezer on the bottom was working because it was freezing up the evaporation track in the back of the fridge. Now the Fridge drains easily into the evaporation pan as it should. The door seals have never been a problem. However, the closing latches are plastic and do break about every five years. One extra latch came with the unit stapled to the top. We just buy and replace as needed. Working with Sun Frost people right now to get the Freezer running again. To replace the Crosley Shelvador 12 cubic foot chest freezer, we are temporarily going to a cheap 5.0 Cubic Foot chest freezer. Not sure we will get the Crosley repaired as there is difficulty getting parts now and 15 years is the usual life of such a freezer. We only were keeping the Crosley 2/3 to 1/2 full so we were wasting energy. With the very small 5 cubic foot chest freezer, we will keep it very full which saves power. If I had a family of 4, I would buy the Frigidaire cubic 8.7 foot 110 volt which has an annual energy useage of 218 KWH. I do like and may consider changing to the Dometic combination propane/ electric fridge. Right now I am not wanting to change my propane service for that. The Sun Dance DC Chest Fridge and Freezers are also looking very good, but it all depends on what works for each user. I think the time to spend mega dollars on a SunFrost has passed. I run an Insignia 11.5 cubic foot fridge freezer that I bought from Best Buy $400 CDN; maybe about $300US. It is rated at 301Kwh/year and is self defrosting, a feature I really like after years with an LP fridge. But the other factor is the much lower price of solar panels. 1000 watts of PV is plenty to run this style of fridge and the cost to me was less than $1000. And I haven't even looked at inverter fridges which work (apparently) just that much better. Hey, mine even has a stainless steel door! I have a full-size Samsung 'digital inverter' fridge / freezer - 269 kWh per year. It's less if you turn off the ice maker. It runs perfect off a 600 watt PSW inverter. Yes, I did have a look at the 3-way fridges. NO WAY. Half less space for three times the price! Also the price of the 'fridge / freezers' that look like oversized chilly bins. They want the same as a new full-size fridge? That's well over the top. The inverter refrigerator I have, which I'm currently logging consumption, uses ~1.1Kwh per day in 25°C ambient both thermostats set at medium. The power factor however is not that great at 0.6, this is not a concern when grid fed because the utility eats the loss, off grid the batteries need to provide for the loss. Just took a reading, Power 60W, Current 0.41A, PF 0.60, voltage is 230V, 230 × 0.41 = 94.3 W so the actual consumption from the battery is ~50% higher than what the indicated useage is, in an off grid application this something to consider. So using the 1.1 Kwh per day as a baseline, that is 401 Kwh per annum, sounds reasonable, but the batteries would have to provide ~1.65 Kwh per day, or 602Kwh per annum. The same would be for most/all AC powered refrigerators to some degree, the DC - AC inverters efficiency may also be affected by poor power factor, so probably the best way to determine actual useage, would be to measure the battery current. Running a Samsung inverter fridge and lg inverter fridge . Samsung for 3 yesrs and lg for 2 years . Lg450l fridge freezer using 299kw per year .. Pleased with both ... lg build probably a bit better . Is that measured consumption, or energy guide guide numbers? Energy guide numbers ..... but i tested against my plug in meter and that indicated over 48 hours a consumption less than energy label . We live a temperate climate though .. summer here .. average max temps average around 25 deg daily . The energy guide numbers are fairly accurate under normal temperatures, right now it's the coolest part of the year here, April is the hottest, so I'm going to log useage until at least May to see the trend. 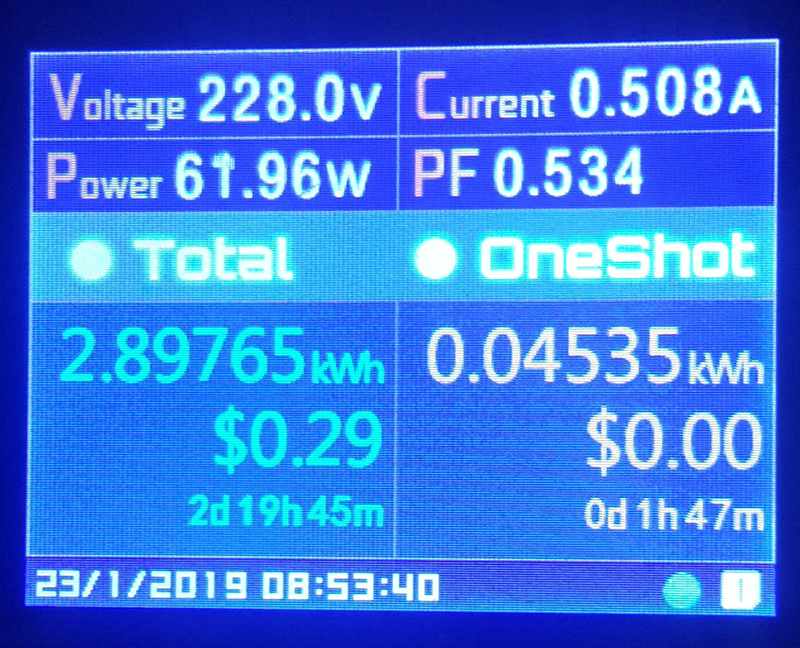 The energy guide for my Panasonic is 324Kwh per year, I suspect it will be higher because ambient temperatures will be >30°C, the screen shot shows normal running, the one shot value is useage since 7am. the power is transferred to another system for four hours per day. Note the power factor, the actual power taken from the batteries is 114W, the power recording can also displayed as a daily list or graph.